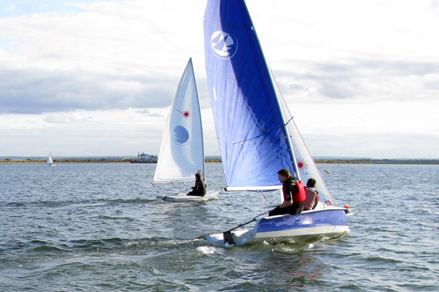 The Old King’s Club Sailing section was established in October 2014 with an inaugural event on St. Mary’s Reservoir. It is hoped that regular dingy and yachting events will be held. The Old King’s Club Hits the Water. On Saturday 25th October a group of intrepid OKC members made their way down to Queen Mary Sailing Club for a day’s sailing. For some this was an unknown for others it was a return to a sport they had undertaken during their King’s days. The wind looked promising and the sun glimpsed through the clouds. The group split with the novices receiving instruction. They were introduced to the ‘Pico’ which soon saw the flying across the water with great excitement. Skills developed quickly and as lunch approached a number were able to move up into the faster Quba boats for the afternoon. Those with experience took out a range of boats and had an exciting morning. 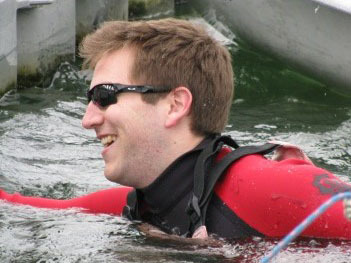 With the wind blowing there were several capsizes to contend with. The temperate water doing only adding to the entertainment. To conclude the days event a mini race series was organised. Who would be the fastest OKC sailor? The pressure rose and there were several close starts and a number of runaway victories. On return to the clubhouse the results were announced. 3rd place went to Josh Elliot, Joint 2nd to the Laser 2000 crew of James Raffety and Felix Parker and James Bryant. It was a close result, with a well-deserved 1st place, and a bottle of wine going to Matt Ferraby. It was an exciting day enjoyed by, even when falling in the water. Many thanks to all who came down and those who offered help for the future. Hopefully this will be the first of many sailing events for the Old Kings Club.